The second half of January is typically the coldest part of winter for most places in the United States. 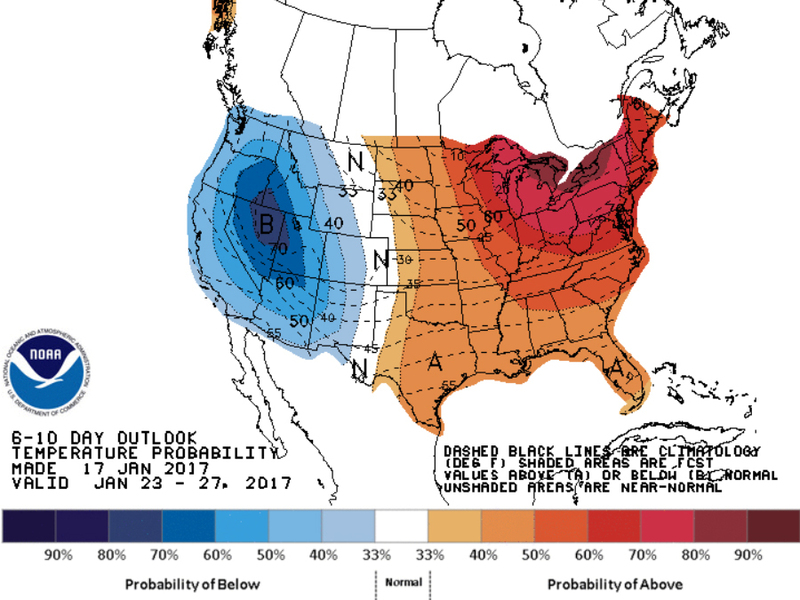 In the eastern half of the United States, temperatures are expected to be anywhere between five and 20 degrees warmer than average through the rest of the week, and mild conditions are likely to last through the end of January. The West, however, is dealing with colder temperatures and another major winter storm. The jet stream has been making a big shift, getting pushed south in the western half of the country while being lifted to the north in the eastern half. This current setup looks like it'll last through the end of the month, which means it's likely we'll see more cold, stormy weather in the West and warmer conditions in the East. Don't get too used to the cold in the West and the warmth in the East we're seeing right now, though. Long-term forecast models show things could reverse as soon as early February.